Nothing is sacrosanct. We know it, but somehow do not believe it. That was why I chose this issue's cover image: to highlight the critical issues facing the subject that we study. Quite literally, these are burning issues. The history of psychical research, or parapsychology, call it what you will, is under constant threat of loss and destruction. Books, journals, private papers, artefacts – everything – is at risk. I had little idea of this until I attended the conference ‘Preserving the Historical Collections of Parapsychology’ in Utrecht earlier this year. As well as discovering the shocking reality, I also found people with enormous energy and determination – real passion – to recover and preserve this history. Some of their stories are printed here; a few more I have solicited from people involved with the same issues. Brandon Hodge has written a brilliant lead article, introducing us to both the thrill of the chase and the terrible truth that often awaits. But there are so many important contributions here from leading experts in their fields that it is impossible to pick highlights. The efforts of these impassioned few should not make us feel that it is all in hand. It is not. That is why I went out on a moonlit night in early October and set light to the SPR's annual report – a copy, I hasten to add. Everyone at Utrecht had tales to tell of collections dispersed, binned or wilfully destroyed. Even our public institutions clear out this stuff, thinking it is outdated, unwanted and in the way. I have delayed part two of my WWI centenary special to bring you these stories while they are still fresh and because I want to pass on that enthusiasm and determination before it is too late. It has been estimated that almost a third of the historical publications on Spiritualism have already been lost forever. As you read this, someone somewhere is destroying something of historical importance. But this is a challenge that we can all take up. It is possible and indeed quite likely – SPR members being who they are – that someone reading this magazine has a collection of importance to the history of psychical research. Read on and you will find out what to do with it and it is critical that you do do something with it. If you have any queries, then I can be contacted at this email address. I wish to express my gratitude to Walter Meyer zu Erpen, who has given unstintingly of his time and expertise in preparing the Utrecht papers for publication. Special thanks are also due to Wim Kramer for allowing publication and providing additional assistance. Of course, none of this would have possible without the contributors themselves and the great effort they have already put in to ‘saving the paranormal’. As a special bonus, I have arranged a 20 per cent discount for readers on the titles featured from publishers Ashgate. You will be able to read more about recent titles Paranormal Cultures, Nineteenth Century Spiritualism and the Occult, and Co-Habiting with Ghosts, as well as the anthology, Parapsychology, edited by Prof. Richard Wiseman and Dr Caroline Watt. Finally, amidst all the alarums and excursions, I am delighted to report that I have received tremendously positive and supportive feedback after my first issue in July. This issue's cover might raise a few eyebrows, but take it as it is meant, a call to arms. Brandon Hodge on the trail of the elusive ‘Snitch Baby’ and others. Walter Meyer zu Erpen discusses the problems of preservation. Melvyn Willin introduces the SPR Archives. Callum Cooper and David Saunders on the CSAPP Archive. Leslie Price on 10 years of Psypioneer. Gerd H. Hövelmann opens his private collection. Eberhard Bauer on the work of Germany's IGPP. Andreas Fischer on art and the paranormal. From Paranormal Cultures to Co-Habiting with Ghosts. Wim Kramer and Anna Rademakers on the Dutch situation. Marty Bax and Andréa Kroon on esoteric archives and the OVN. Leo Ruickbie gets inside the Institut Métapsychique International. Renaud Evrard details the archival holdings of the IMI. René Schurte on Zurich's hidden archival treasures. John Reed on the World Institute of Scientific Exploration. Shelley Sweeney introduces the Hamilton Collection. Marc Demarest on the work of IAPSOP. Preservation in Argentina with Alejandro Parra. 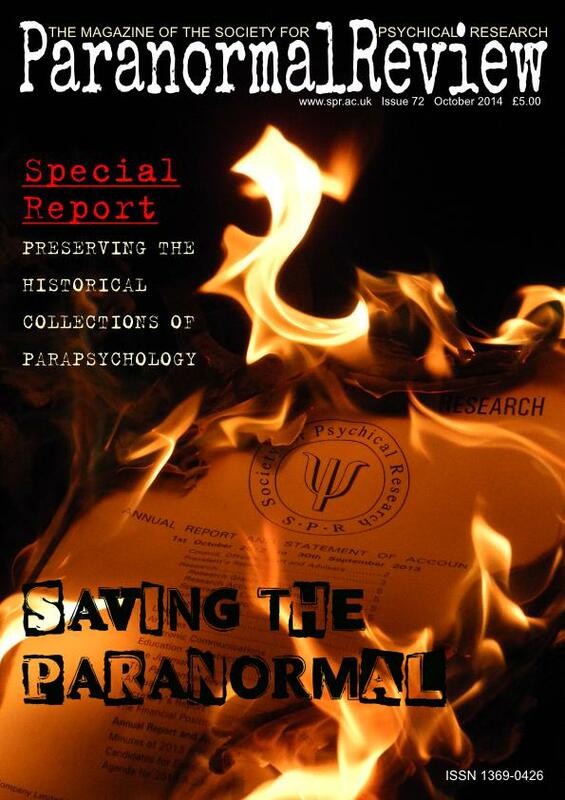 Walter Meyen zu Erpen, Leo Ruickbie and Shelley Sweeney review ‘Preserving the Historical Collections of Parapsychology’. The 38th Annual International SPR Conference in York.